Colorado’s spas are serving up more than the ultimate in relaxation. With organic treatments inspired by what tantalizes taste buds — champagne, decadent chocolates and luscious fruits — they allow you to indulge and rejuvenate in a delightfully calorie-free manner. The Oooh: In the heart of Denver’s LoDo, The Oxford Club Spa beckons urban dwellers to escape the mania of the city for a little me time at the fitness center, spa or salon. One treatment that’s worth 70 minutes of your time and every penny of the $125 fee is The Oxford’s signature Almond Joy Experience, which uses product from the world’s No. 1 organic skincare line, Eminence, and includes a coconut scrub, a chocolate mousse masque wrap and, after a steamy shower, is topped off with a warm almond oil massage. The Ahhh: Silky smooth skin, anyone? You’ll feel energized and exfoliated courtesy of the coconut scrub, infused with antioxidants from the cocoa in the chocolate masque and moisturized without feeling greasy from the almond oil. The Oooh: The professionals at TallGrass Aveda Spa & Salon transport your cares away when they manipulate your weary muscles, buff your bod and coif your style in Evergreen. But, it doesn’t get much better than the Chocolate Indulgence all-natural wrap. Whether you select the 50- or 80-minute treatment ($90–115), your body gets embraced in a wrap of chocolate and vanilla with your choice of tangerine, cinnamon or peppermint essence. Catch a 15% discount if you book on the day of service (for open services only). The Ahhh: More than just a marketing ploy to tug at our vulnerability to anything chocolate, chocolate offers a non-toxic, non-chemical treatment choice with proven relaxation and moisturizing benefits. The Oooh: Get that warm and homey feeling — literally, since this spa is in a 19th-century home — when you step into the Colorado Avenue Day Spa in Pueblo’s Historic District. With an expansive list of massages, reflexology treatments and natural facials, Colorado Avenue Day Spa has all the tricks to put you back in balance. What gets our pores pumping are the 60-minute, $65 natural facials that feature oriental facial massage and a steaming herbal tea towel. Take your pick from honey, cucumber or pomegranate facials to invigorate your skin. The Ahhh: Honey treats your face to natural moisturizers and organic antibacterial properties. For skin that’s seen too much sun, the cucumber facial is a cool fix. The pomegranate facial feeds your skin antioxidants for protection from harsh environmental exposure. The Oooh: If the alpine setting at the base of Beaver Creek Mountain doesn’t tame the tension, we’re pretty sure the treatments at the European-style Allegria Spa will. This 30,000-square-foot nirvana has 23 treatment rooms plus a full suite of services including the Aqua Sanitas Water Sanctuary, a series of hydrotherapeutic pools. The decadent $275 Ginger Peach Cure is 1 hour and 40 minutes that begin with an invigorating scrub with freshly ground ginger and orange peel followed by a Swiss shower rinse and a full-body massage. The treatment’s cathartic conclusion is a ginger butter body wrap that is applied while you relax under warm blankets and your neck, shoulder and scalp are massaged. The Ahhh: You’ll walk out (if you can get your legs under you that is) from the Ginger Peach Cure with an entirely new attitude. Your skin will be buffed and hydrated while your muscles and your mind will be completely relaxed. The Oooh: Extraordinary experiences await you at Remède Spa in Aspen, where you can make an appointment for the Champagne and Chocolate Truffle Decadence Body Facial ($250). The treatment begins with a champagne scrub to exfoliate, then a chocolate mask to hydrate. While the mask is on, the professionals invigorate your scalp with a massage. The finale is a 30-minute massage with chocolate lotion — an upgrade to a 60-minute massage is $70 more. The Ahhh: The Laboratoire Remede skincare line used here battles the natural aging process and corrects and protects skin from environmental factors. The antioxidants in champagne also help repair damage. The Oooh: This spa, in the heart of downtown Breckenridge, has a singular focus: to provide premium spa services in an unmatched atmosphere. If the awards they’ve received are any indication, they are doing something right. We were particularly intrigued by this trio of facials: the spa’s signature Pineapple Papaya Delight, Cranberry Hydration Station and Pumpkin Anti-aging, each with a foot treatment as well. But, really, who can resist the mouthwatering aroma of pumpkin? This is a 90-minute treatment for $139. The Ahhh: Damaged or distressed skin will benefit from the antioxidants found in the pumpkin facial that uses Sanita’s Gourmet Skin Food product. See for yourself if the anti-aging claim is true. The Oooh: This Colorado Springs spa offers a full range of services including medical-grade skin-care services, a hair salon and the Bath, Body, and Home Fragrance Gourmet shop, where you can purchase a wide variety of products from around the world to continue your spa experience at home. 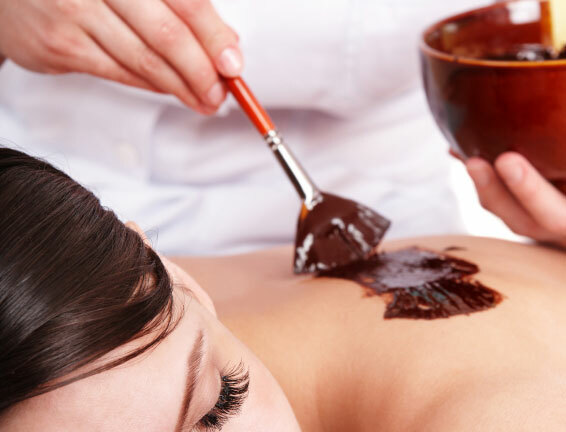 The Peruvian Chocolate Massage is a 90-minute treatment that is pure chocolate bliss beginning with Bell Lucces chocolate scrub to kiss lackluster skin goodbye. After a good rinse, the chocolate cosseting continues with a massage assisted with Peruvian chocolate crème. The Ahhh: Finally! No more excuses for our love of chocolate. The product used in this treatment sloughs off dead skins cells while nourishing with natural moisturizers.